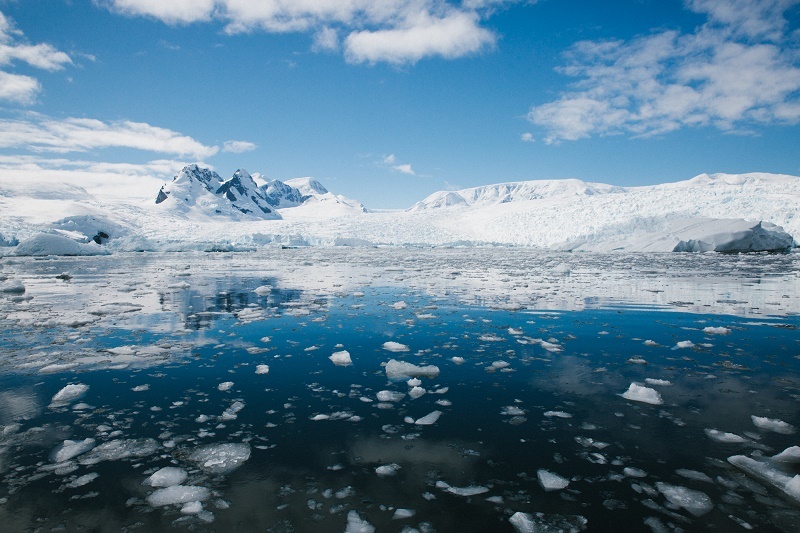 If there is one type of holiday where you can very much expect the unexpected, it is polar cruises to Antarctica like those provided by WILDFOOT. Again, our travel advisor had much to say about her incredible experiences on the latest day of her trip, including a visit to a site that is inaccessible for much of the year. Overnight we had sailed to Cierva Cove and the plan was to do a zodiac cruise this morning. The cove is known for its rugged mountain line and abundance of icebergs and with the still, mirror like water the scene was only enhanced by the incredible reflections. We spent almost three hours cruising amongst the brash ice and icebergs, absorbing the splendour of this place. 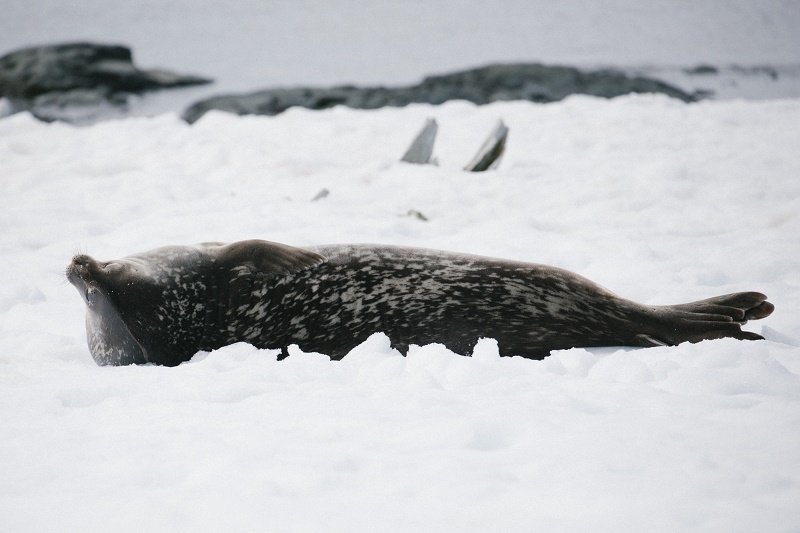 We also struck lucky with leopard seals and had two close encounters, one with a curious individual that came and played around our zodiac and another with a big fat one asleep on a small ice floe that barely opened its eyes to acknowledge our presence. Shortly after returning from our morning excursion a call was made that some minke whales had been spotted on the port side, so we quickly dashed outside to see a small pod travelling at the surface. They kept their distance from the ship but gave us our best views of the voyage so far and a reasonable chance of getting a few decent record shots, I suspect they were much closer when the watch officer on the bridge spotted them! After an alfresco lunch out on deck we had a landing at Mikkelsen Harbour, which is home to a gentoo colony and a small Argentinian refuge, which to be honest consisted of nothing more than a small hut. We also found a small haul out of Weddell seals on some ice and a couple of crab eating seals on the pebble beach which were slightly more active than previous seals we had seen. The colony had no shortage of predators either, with not only nesting skuas, but a few pairs of southern giant petrels. Back on board we assumed that was it for the day, however an announcement was made that due to the favourable weather they were going to try for a third activity, a zodiac cruise of Spert Island. 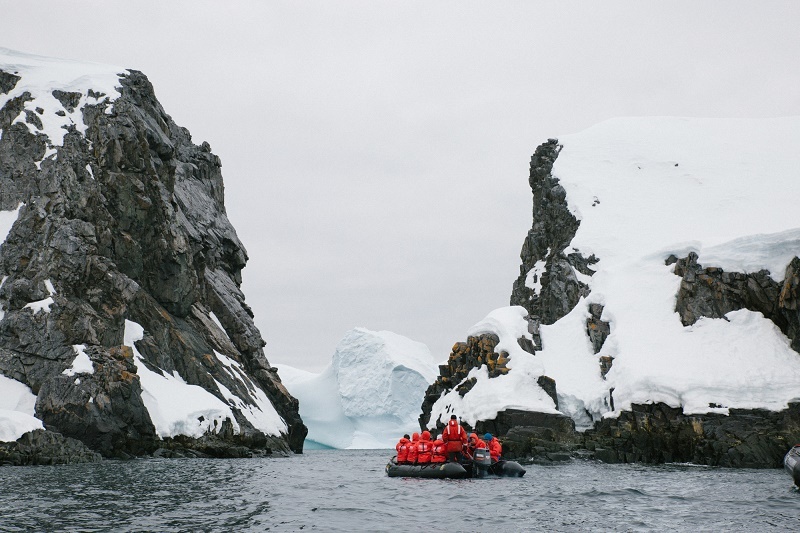 Spert Island is very rarely accessed due to its position, it is situated in open waters which are notorious for large swell, making zodiac cruising virtually impossible for much of the year. There seemed to be a real excitement amongst the crew about this site, many claiming that it was a favourite due to its unique characteristics, evidently there is nowhere else like it on the peninsular. Therefore, we delayed dinner and boarded the zodiacs once more to start our exploration of this fascinating area. 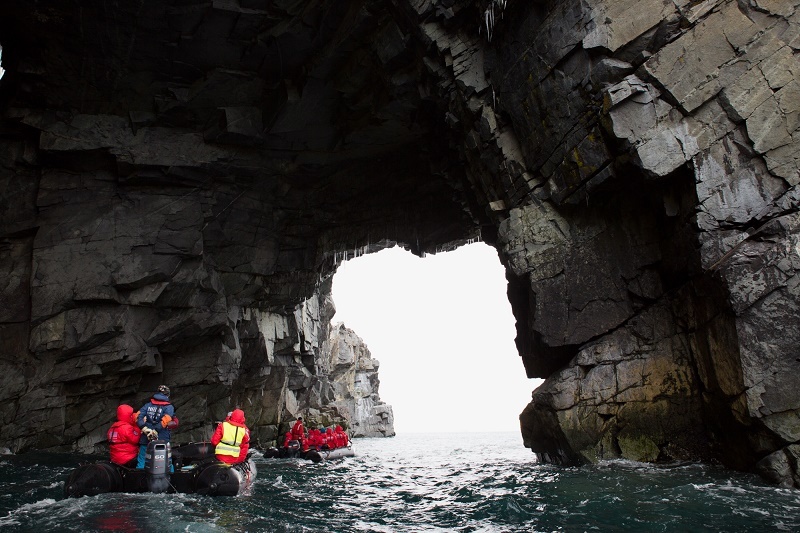 As we crept closer in zodiacs, narrow waterways were revealed, providing access to a hidden network of grounded icebergs, towering archways and maze-like water. Other zodiacs created a sense of scale whilst the cape petrels nesting high in the rock arches provided the soundtrack to the iconic scene around us. On reflection, I can completely understand why there was great excitement about this site, in terms of landscape this was by far the most dramatic and unexpected, it was not what most would imagine of Antarctica. After dinner was complete we went back out on deck for another hour or so, just continuing to soak it all in. Words, photos and film just cannot do it justice.